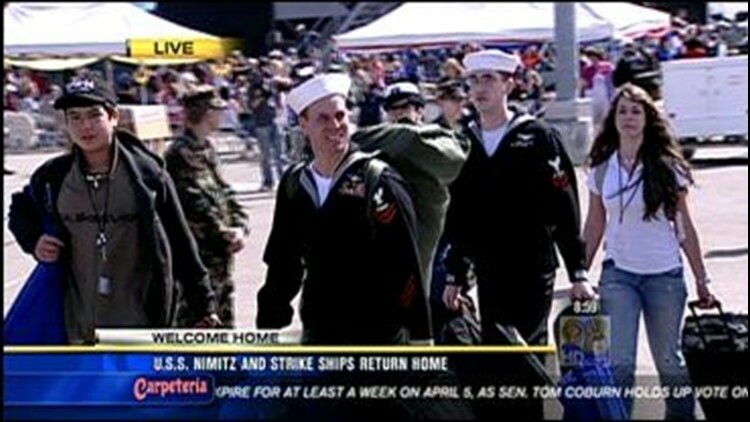 SAN DIEGO, Calif. (CBS 8) - Friends and family welcomed 7,000 sailors aboard the USS Nimitz and three ships in its strike group home Friday at North Island. The Nimitz Carrier Strike Group deployed on July 31 and its ships -- the guided-missile destroyers Pinckney and Sampson and guided-missile frigate Rentz -- performed over 2,600 sorties supporting coalition ground forces in Afghanistan, according to the U.S Navy. The destroyer ships also performed anti-piracy operations off the Horn of Africa and guarded Iraqi infrastructure in the Persian Gulf. The USS Nimitz stopped at ports in Hong Kong, Thailand, Japan, Singapore, United Arab Emirates and Malaysia.